Fat in cheese is not always unhealthy. So, go ahead. Know your cheese and spice up your life. 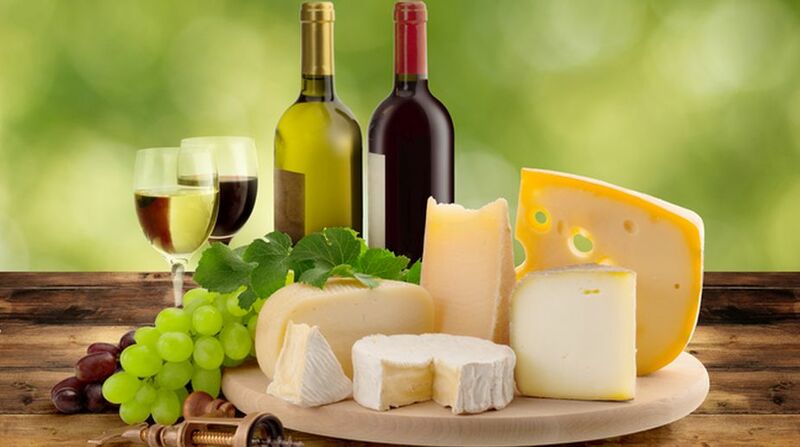 Cheese and wine for the mind and moods? Well, cheese is one of the most versatile ingredients in cooking from baking to sautéing. And fat in cheese is not always unhealthy. Different countries measure fat content differently. There are no standards to measure it. According to the British Cheese Board, full-fat cheese contains 34 to 35 per cent fat, low-fat cheese contains less than three per cent fat and fat-free contains less than 0.15 per cent fat. In fact, nutrients in milk fat are good for heart health according to a 2010 study by researchers at Australia’s Queensland Institute of Medical Research. Also, cheese contain Vitamin A, D, E and K. And reduced-fat-cheeses with emulsifiers often melt well and give the dish the same physical effect of real cheese if not the taste. Believe it or not, there are thousand types of cheese in the world. Here are types of popular cheese you need to know. Roquefort is a popular cheese that originated in France. It takes five months to mature and is famous for its multi-layered rich flavours. Feta cheese is a Greek product and it is considered to be pure only if it has been produced in Thessaly, Macedonia, Lesvos, Thrace, Peloponnese and Central Mainland Greece. It takes two months to prepare and its milk source is goat. It usually comes in squashy texture but sometimes it can be a bit crumbly. Mozzarella requires no introduction. Most of the people are fascinated with Italian pizza topped with a layer of mozzarella cheese. This cheese is made from buffalo’s milk and needs no ageing for its usage. Having salty taste and crumbled texture, this Mexican cheese is good for garnishing. Fresh cotija has a mushy texture but it gets hardened as it ages. It takes to prepare three to 12 months to prepare this cheese. The origin of this cheese is sheep milk and it takes three to 12 months to age. Fresh manchego tastes fruity and the oldest tastes sweet. Spain takes the credit of introducing this cheese to the world. Originated in the Netherlands, this world famous exotic cheese has a creamy texture as it is made from cow’s milk. The luscious textured cheese is famous all around the world. It may take 9 to 24 months to make depending upon the conditions of climate and temperature of a particular region. The colour can vary from white to yellow to dark orange. It is truly the pride of England. Quite delicious with a subtle fruity taste, the origin of this cheese is Italy. Containing 48 per cent of fat, this cheese is aged for 10 weeks and washed every week with seawater to ensure protection against fungus. The cheese having a number of holes is formed after fermentation. Hard in texture, this fruity cheese is a rich Swiss delicacy. Produced from cow’s milk, this California-based cheese doesn’t take much time to age. Its taste is almost that of cheddar. The French-made cheese is made from goat’s milk. It is a rich source of potassium and vitamins. The fat content is low. Its earthy flavour is quite famous across the globe. The French cheese is the most exquisite of all cheeses. It is produced by only few manufacturers with a special technique. The more it matures, the creamier is the texture and the taste. Commonly known as parmesan, its popularity is proven by the fact that it’s the world’s most preferred cheese. An Italian product, this nutty flavoured cheese has less calories and more calcium as compared to other cheese varieties. Due to its versatile nature, it is recommended by the best chefs worldwide.